Vegan Eats and Treats! 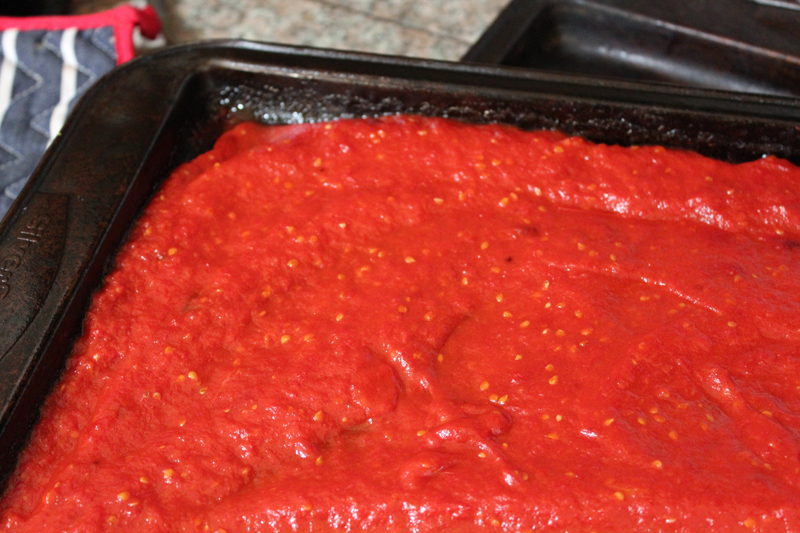 : MoFo: Homemade Italian Tomato Paste, "Conserva"
MoFo: Homemade Italian Tomato Paste, "Conserva"
Two years ago, I had a glut of tomatoes and my friend Kittee suggested a great recipe that used up many pounds of tomatoes, and made a super rich tomato paste. I made a batch, popped it in the freezer, and started using a little bit of it every time I made soup or wanted to add some serious umami tomato power to my dinner. Frankly, we fell in love with that stuff. It's hard to put into words just how flavorful and rich and amazing this stuff is. 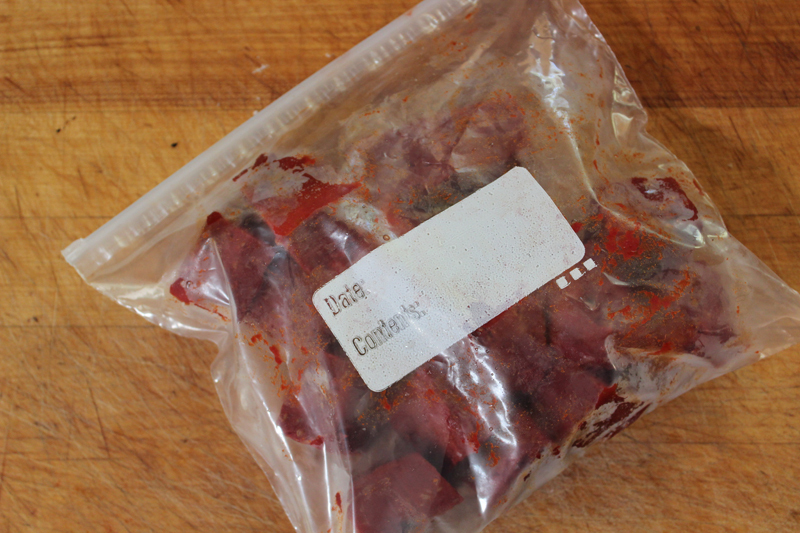 The problem was, I had totally forgotten what it was called and hadn't bookmarked my recipe. I asked Kittee and she didn't remember either. I was desperate! All I remembered was that it started with the letter "C."
Well, we recently finally used up our last cube of "tomato power," and in a state of panic, I got down to some serious Googling ... and voila! I found it!! The glorious tomato power umami flavor cubes were called "Conserva." There are a lot of good recipes and ideas for conserva online, and I read a bunch of sites, then sort of combined a few of them. tiny little guy full of power! The recipe starts with 5 pounds of tomatoes, and ends up with about 16 1-inch tomato boullion cubes. That's roughly 1 pound of tomatoes per 3 cubes of conserva. 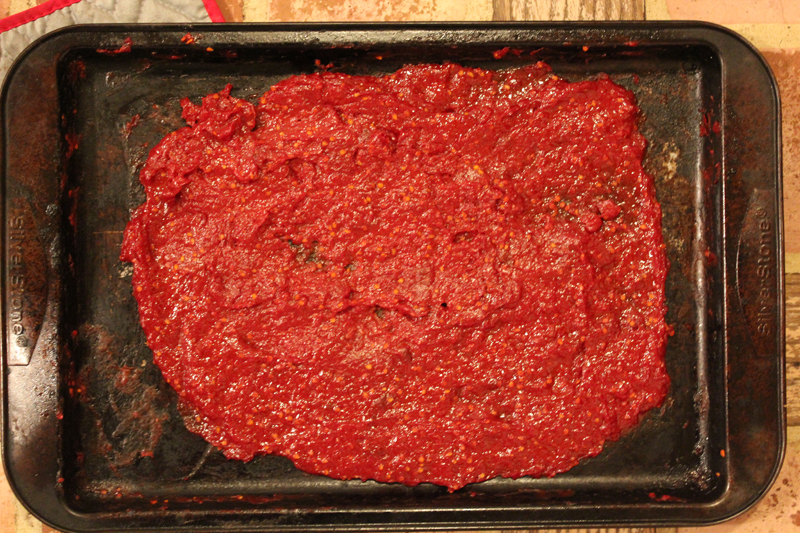 It's basically an Italian tomato paste with some salt and olive oil... but the end result is totally out of sight. I used: 5 lbs dry-farmed tomatoes, 2 Tbsp olive oil, and 1/2 tsp salt. 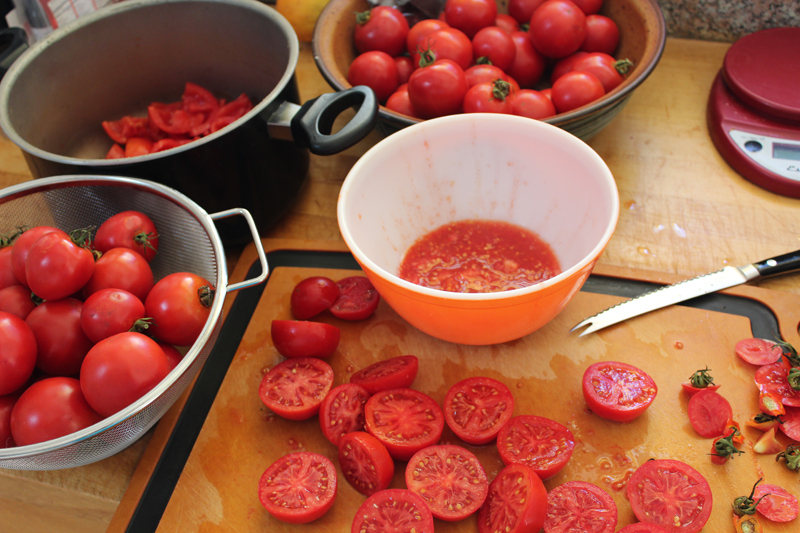 First I washed and halved / quartered all the tomatoes. All of that went in to a pot (top left) with the olive oil and salt, and was brought to a boil over medium-high heat for about 30 minutes or so... "until the skin was beginning to soften and peel off the flesh of the tomatoes," as directed by one of the recipes. Some of the recipes said to seed the tomatoes, so I did that. But then, I was looking at that bowl full of tomato flavor, and I couldn't bring myself to leave it out. So I boiled that stuff down for a little while too. 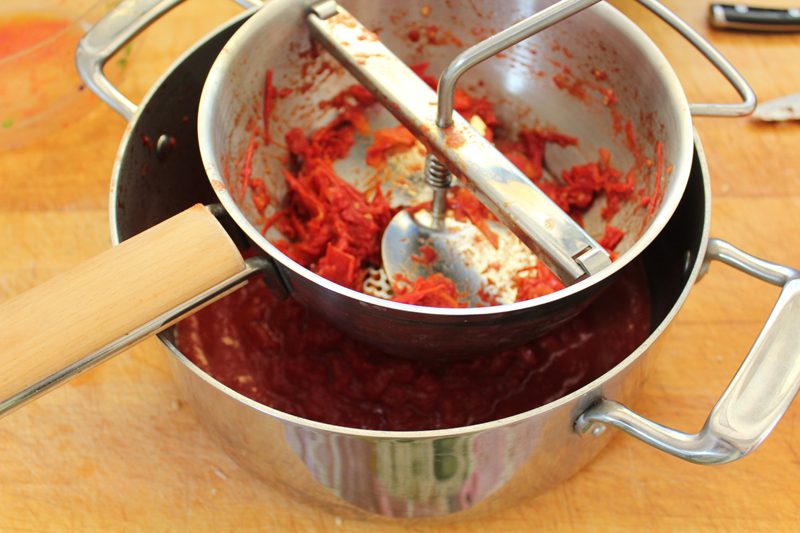 All the stewed tomatoes and the cooked down seeds/juice were run through a food mill to create a pot of thick soupy tomato-ness. I don't have a super fine screen for my food mill, so a few tomato seeds got through, but that is totally okay with me in exchange for more tomato flavor. You can see, at this point it's just a thick, lightly-cooked tomatoey liquid. I poured that tomatoey soup into a rimmed baking sheet, and baked it at 325 for about 1-2 hours. I know that's a huge window, but it really just depends on how liquidy the tomatoes are, how your oven works, etc. I used convection bake, so there would be more air circulation. You've got to keep an eye on it, and give it a stir every 30 minutes or so. I know this isn't a great picture, but you're looking for the time when the mixture starts to pull away from the edges a little bit. That's a sign that it's starting to thicken, and at this point, it's time to turn the heat down to 200 F for another 1.5-2 hours. You still need to stir every 20-30 minutes, because the edges and the top cook faster and you gotta keep mixing it around. The mixture will thicken and thicken and reduce and reduce until you are left with something like this. The moment I knew it was ready was when the mixture suddenly had a shiny, brick-red look to it. 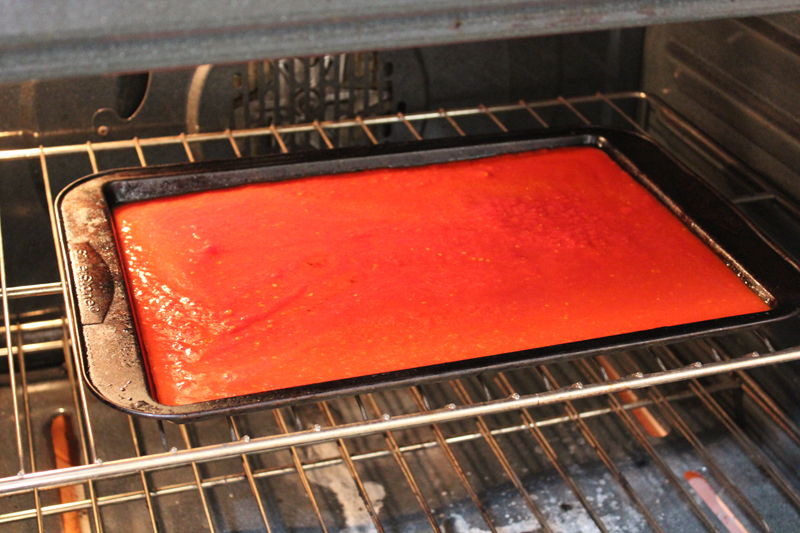 It's sorta half-way between fruit leather and tomato paste. It's really thick. 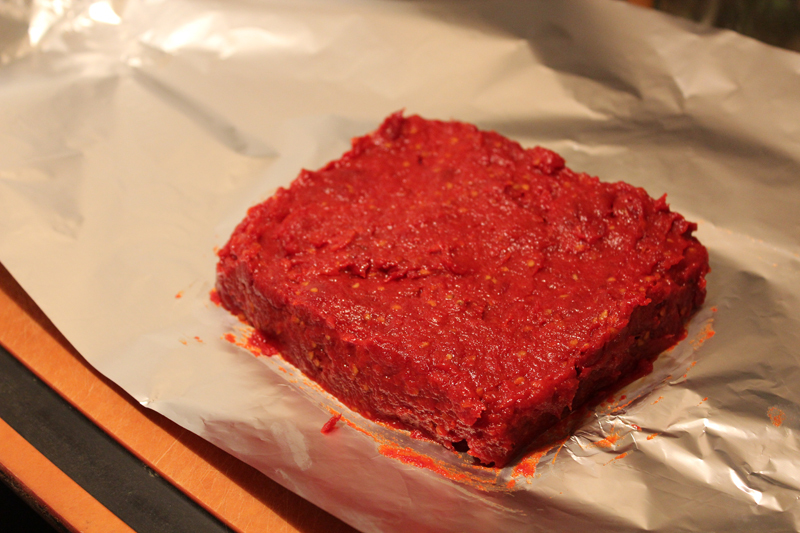 I packed all that tomato paste onto a piece of foil, wrapped it up and popped it in the freezer. Remember, this started off as 5 pounds of tomatoes! This square is probably about 5 or 6 inches long on each side. 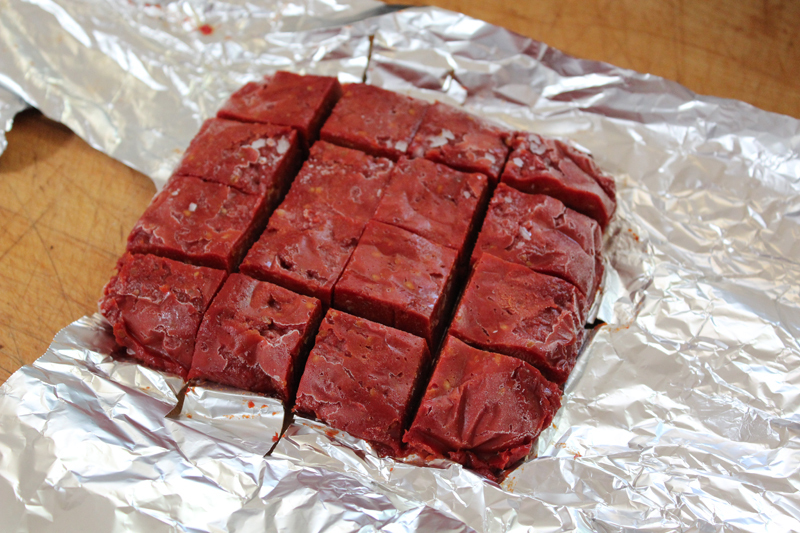 The next day I took it out of the freezer, and used a super sharp knife to cut it into 16 cubes. The foil was sorta sticky, so next time I'll use parchment paper for less fuss. In the end, I got 16 cubes of pure caramelized tomato power umami goodness. You guys. This stuff is SO GOOD and SO SPECIAL. It's definitely a project to make, but it mostly just requires you being around the house, not a lot of actual work. In fact, I already decided to make another batch, because I don't think this will be enough. All the power and glory of a full-sized Amey in a tiny little Tomato-Conserva-Sized Amey! Tomato power! Did you use it instead of tomato paste? I totally know what you mean. I felt very industrious! Tomato umami! I have to try this! Thanks for the super detailed instructions. let me know if you ever try it. It's actually really easy! Oh wow, this sounds SO good. I want it!! This sounds so good. I made a small batch of fresh tomato sauce yesterday but I'm impressed and inspired by all your epic tomato posts! 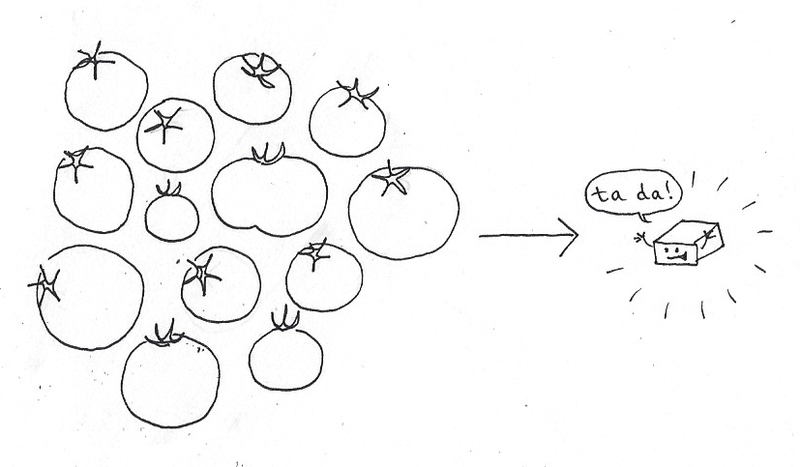 This is incredible and I am bookmarking it in case someone ever gives me a crapload of tomatoes. Also, tiny conserva Amey is the FUNNIEST THING EVER! You are so clever I can't even stand it! ha ha - thank you so much Randi! Tiny Conserva Amey is one of my favorite doodles of all time. I was cracking myself up while I was drawing it! Wow, this is super interesting! 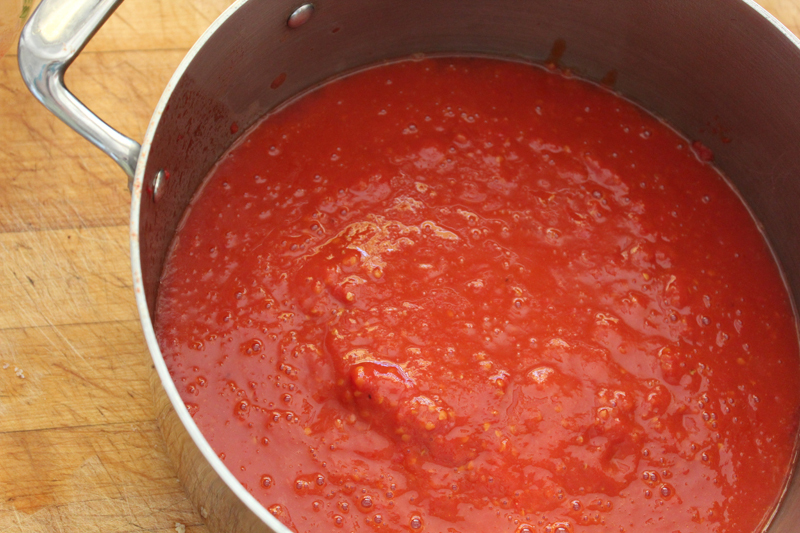 I've never made a super-reduced tomato preserve like this. What a great idea! Wow! Thank you for this idea!Tomato Conserva Amey is so cute! !